On Masechtot: Ketuvot, Gittin, Kedushin. By the Gaon Rabbi Yaakov Yehoshua Folk. Stamp of Yosef Frankel Teumim, a very respectable family. 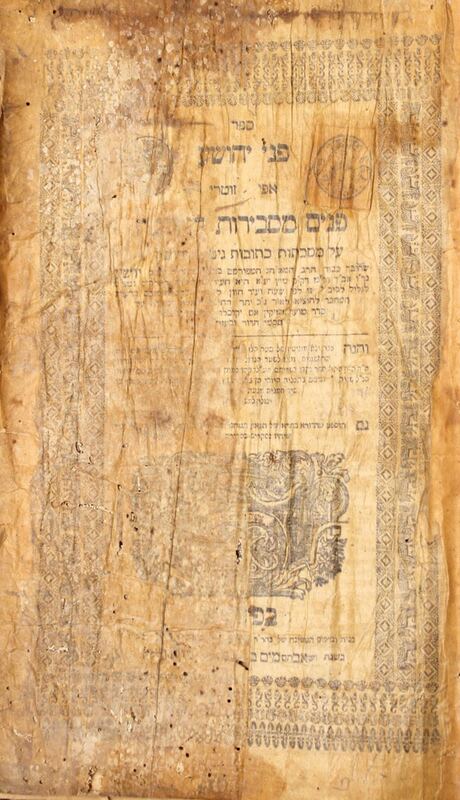 | Yaakov Yehoshua Folk (1681-1756) was the rabbi of Lviv, Berlin, and Frankfurt. Author of a series of books called Pnei Yehoshua on the Talmud Bavli. The Hida says that succeeded meeting him and described his face like that of a heavenly angel. It is said that when the Ba’al Shem Tov was told by G-d that he would serve a Talmid Chacham, he went to serve the Pnei Yehoshua, and brought him a coal from the fire to light his pipe. They conversed together about the Chassidic movement. He was the direct rabbi of the Maggid of Mezeritch. | Binding partially disconnected. Signature of ownership. Moth damage. | 4, 212, 217-296, 23 pages. 32cm. Generally ok to bad condition.